We aim not only to get you great deals but to educate. Here is your history lesson today. In the 12th to 13th centuries, many people could not afford the Psalter book of 150 psalms used in prayer, and many devoted Catholics could not count or read. Eventually, preachers and clergymen encouraged Catholics who could not afford the Psalter or who could not count how many prayers they had recited to use a string of knots or beads to aid prayers. The earliest form of rosary beads represented the Lord's Prayer, the Hail Mary (Ave Maria), and the Doxology. Later, more prayers were added and the rosary was made with brightly colored stones, and in today's world, the shape and color of the beads vary greatly, but this rosary made with 6mm white gold-plated beads is a stunning way to proclaim your faith. 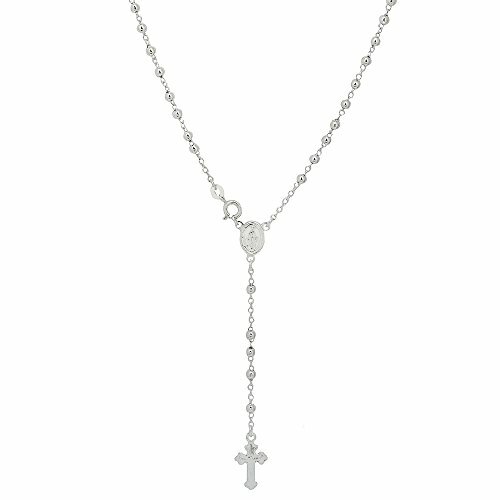 This 2mm Rosary Beaded Necklace Measures 18 inches. If you have any questions about this product by NYC Sterling, contact us by completing and submitting the form below. If you are looking for a specif part number, please include it with your message. Beauniq Solid Sterling Silver Rhodium Plated Open Circle with Bar Lariat Necklace, 22"
Baltic Amber Necklace and Matching Amber Earrings Set with Large Cross - Sterling Silver 16" - 18"